This is a riff on a childhood fave. Mix sour cream, mayo and blue cheese in a large mixing bowl. In a separate bowl, put the shrimp in cold water to thaw. If you like your broccoli raw, you can skip this step: Place broccoli and 1/4c water in a rice cooker and press cook. 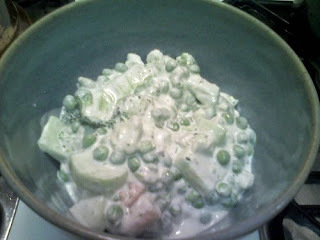 Dice the cucumber and fold it into the creamy mixture. Drain the shrimp and fold into the creamy mixture. Rinse the shrimp water bowl and refill with cold water. Place the peas in this water. Take the broccoli out of the rice cooker and roughly chop the florets (especially if they are larger than bite-sized). Fold the broccoli into the mixture. Drain the peas and fold them in. Serve in a cold bowl, pronto!